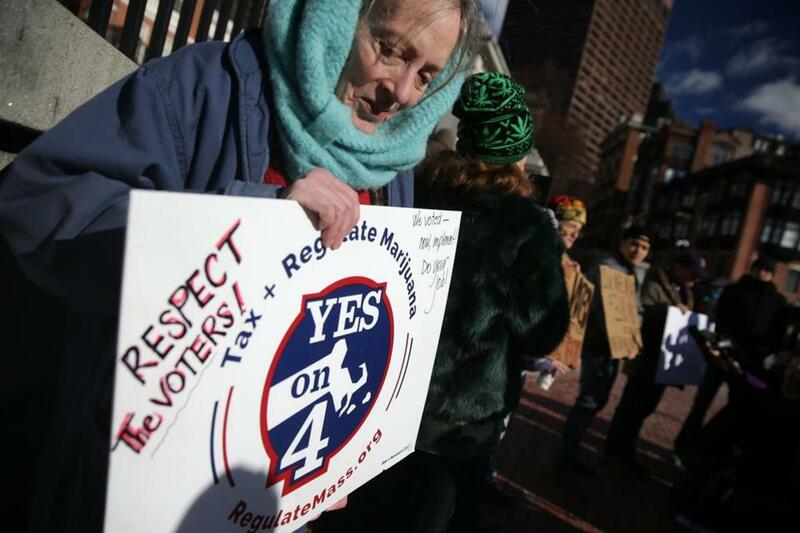 Kathryn Rifkin protested the delay in the marijuana law at the Massachusetts State House. As one of the cofounders of the Massachusetts Cannabis Reform Coalition, Linda Noel has spent decades fighting for the legalization of marijuana, a victory that voters finally handed her in November. Now, longtime advocates like Noel will have to wait a few more months. Governor Charlie Baker on Friday signed off on a measure that delays several parts of the state’s new marijuana legalization law, postponing the likely opening date for recreational retail shops by half a year. The move was announced just as demonstrators — some of whom said they’d hoped the days of legalization rallies were behind them — gathered at the State House to urge Baker to veto the plan. The likely opening date for recreational marijuana stores in Massachusetts is now July 2018. Because parts of the new law that allow growing, gifting, possessing, and consuming marijuana are already in force, the delay will prolong a legal conundrum: Buying, smoking, growing, and giving marijuana away will be legal, but selling will not. “To make people continue to buy from the black market is ridiculous,” said Noel, of Franklin. The delay emerged from the Legislature earlier this week, when a handful of lawmakers — without public hearings or formal public notice — approved the measure in just a matter of minutes in both the House and Senate. “The Baker-Polito administration has been clear that it shares the Legislature’s desire to thoroughly prepare for launching an entirely new industry distributing a controlled substance and is committed to adhering to the will of the voters by implementing the new law as effectively and responsibly as possible,” said Baker spokeswoman Lizzy Guyton. Baker and most lawmakers opposed the legalization law, which left some who came to the demonstration wary of the motives behind the delay. “They’ll come up with anything,” said a man who identified himself as D. Cleary. He said the delay forgoes six months of tax revenue — the law includes a 3.75 percent tax on sales on top of the state’s 6.25 percent sales tax and an optional local tax — at a time when the state is cutting services amid revenue shortfalls. The bill that Baker signed includes delays in several provisions of the law that voters approved. For example, state Treasurer Deborah B. Goldberg will have until next September to appoint a three-person Cannabis Control Commission, instead of next March; and the commissioners will have until March 2018 to pass initial regulations. Joseph Gilmore, a senior at UMass Boston who campaigned for marijuana legalization with the group Students for Sensible Drug Policy, called the delay frustrating. “Voters expected that shops would be open Jan. 1, 2018,” said Gilmore, an economics major from Dorchester. Surrounded by Yes on 4 signs left over from the campaign, Noel urged lawmakers to hew to the letter of the law that voters approved. Globe correspondent Olivia Quintana contributed to this report. Nestor Ramos can be reached at nestor.ramos@globe.com. Follow him on Twitter @NestorARamos.